I've been thinking about this story for quite some time, but something came together the other night out on post at the prison that forced me to put my thoughts down on paper. Fourteen years later I frequently still think about that simple, yet profound definition. I've realized and learned though, that with grace comes responsibility. For example, God blessed me with beautiful children, but I have a great responsibility to care for them. Dietrich Bonhoeffer, in his book The Cost of Discipleship beautifully describes grace and refers to “cheap grace” and “costly grace”. Simply put, when we abuse grace of any kind, we demean its value to us. When we knowing and willingly "sin" like there’s no tomorrow, we devalue grace in our lives (cheap grace). When we acknowledge and appreciate grace in our lives, take it seriously with gratitude and share it with others we heighten or raise its value toward what God meant it to be, acknowledging "costly" grace. The other night while out on post duty at the prison (patrolling the perimeter) I came within two feet of an Armadillo rooting in the grass for grubs. I just watched it for a while, appreciating how its armor can protect it. I saw a Raccoon scavenge for food and climbed a tree when I approached. I was able to witness for some time a deer family feed. 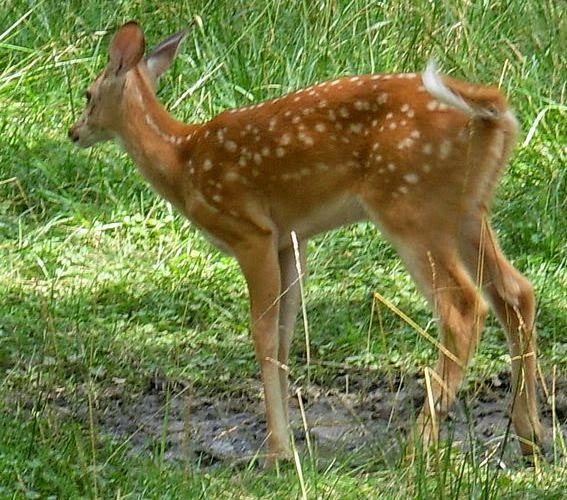 The Papa was so close I could count his four young antler points in the darkness, and on the fawn I could see it’s faint spots on its hind leg. Mama was there too. “This is grace!”, I thought, and suddenly realized the “cost of grace” in this situation. If we take our environment for granted, we lessen its value. If we appreciate nature and practice sound conservation, we will be able to share this “grace” with our children and future generations. This is what stewardship is all about, taking care of the little bits and pieces of grace we encounter daily, and share them with others. In this way we show our gratitude to God, and bless our own lives and others. So the next time you see a child, a squirrel, butterfly, sunset or other beautiful thing take the time to appreciate it and thank God who provided it, then say, "Hey Look!"